Figure 1. Oregon Iron Company furnace in 2010. Wikipedia. 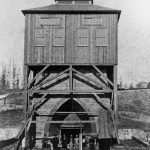 Oregon Iron Company included eighteen Chinese laborers among their initial work force when the smelter began production in 1867. The Chinese immigrants worked in the mine, hauled ore to the smelter and made charcoal for the furnaces. The charcoal was initially produced in large pits but beehive shaped brick kilns were later constructed (Figure 3). Over 300,000 bushels of charcoal a month was needed during peak iron production. The Chinese iron worker’s community was located south of Old Town Lake Oswego in what is now George Rogers Park. The 1880 census records that the Chinese lived in group households of seven to twelve men. Their houses were log cabins or plank shacks covered with tin roofs. The Lake Oswego Library has collected interviews with longtime residents who recalled the Chinese presence in Oswego during the iron era. Mr. Yates noted that “the Oregon Iron & Steel Company in Oswego was booming in 1890 and the area of George Rogers Park, now occupied by the ball fields, was something of a small Chinatown.” Jerry O’Brien recalled that the Chinese were paid $.90 to $1.00 a day to push ore from the ore shed to the furnace and that they “lived by themselves, old fellows in shacks along the [Willamette River] below the river bank.” Although no evidence of the Chinese community has survived above ground, future archaeological research in the area may provide evidence about the buildings and lifeways of Chinese workers. 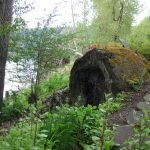 Access Directions: George Rogers Park is located at 611 S State St, Lake Oswego, OR 97034 in Lake Oswego, Oregon. 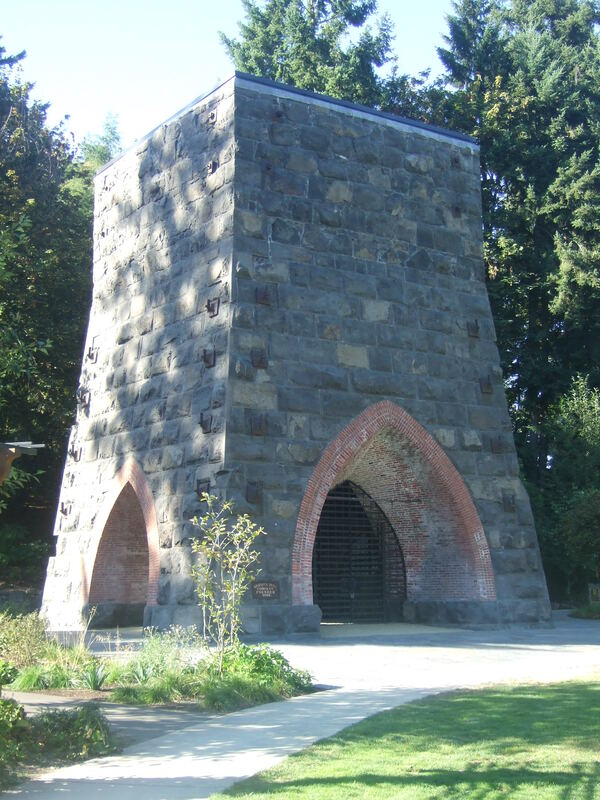 The remains of the original furnace is located at the east end of the park, overlooking the Willamette River (Figures 1 and 2). The Chinese workers housing was located at the ball fields in the park. One of the original charcoal pits is at Site 2 on the Oswego Iron Heritage Trail which connects several historic places showing the history of the iron works. The trail can be accessed at George Rogers Park. Figure 2. Oswego Iron Works furnace under construction in 1866. Lake Oswego Public Library and the Oregon Iron Chronicles. Figure 3. 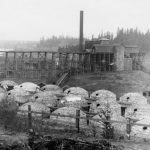 Beehive charcoal kilns at the Oswego Iron Works. Lake Oswego Public Library and the Oregon Iron Chronicles. Figure 4. Remains of the curvible of the second furnace in Lake Oswego’s Roehr Park on the bank of the Willamette River. Wikipedia.